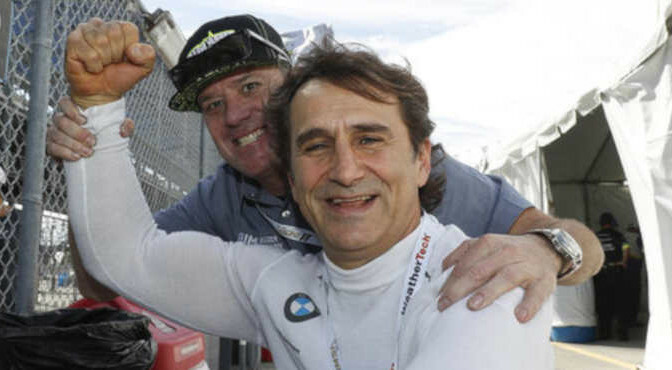 In many ways, Alex Zanardi was as much rock star as race driver during his time at Daytona International Speedway last week preparing to compete in the IMSA WeatherTech SportsCar Championship season-opening Rolex 24 At Daytona on Jan. 26-27. And it wasn’t just race fans with love in their eyes, respect in their heart and an eagerness to interact with the former IndyCar champion as he made his way around the track. Team engineers, series officials, corporate bigwigs and a long line of his fellow drivers – including Formula 1 star Fernando Alonso – took turns greeting and hugging Zanardi. And just grinning. So many are so incredibly grateful to see the 52-year old Italian back in their race paddock preparing to work his magic behind the steering wheel again competing for the first time in a car stateside since he lost his legs in an open-wheel race in 2001. The good vibe was palpable, and a perpetual grin hung ear to ear as Zanardi navigated all the love. “Finally I am here and so this is very, very special,’’ Zanardi explained, speaking to reporters at the Roar Before the Rolex 24 three-day test session at Daytona International Speedway last weekend. “On top, to be in the same paddock with a lot of friends and be stopped basically every foot by a different friend who I haven’t seen in a long time, it’s really sweet. Zanardi is entered in the GT Le Mans (GTLM) class and will co-drive the No. 24 BMW Team RLL BMW M8 GTE with John Edwards, Jesse Krohn and Chaz Mostert in the 24-hour race. It marks the first time he has competed in the United States since he lost both legs in a racing accident in a September, 2001 CART (now called IndyCar) Series race in Germany. After earning back-to-back CART series championships in 1997-98 driving for Chip Ganassi Racing, Zanardi spent a season-long effort in Formula 1 in 1999 before returning stateside to rejoin the CART series in 2001, driving for Mo Nunn Racing. After leading 20 laps in the CART race at Germany’s two-mile, triangular EuroSpeedway Lausitz oval that fall afternoon, Zanardi crashed 13 laps from the checkered flag, losing both legs in the horrific incident. His injuries were so severe he was airlifted to a nearby German hospital. Even this dramatic and emotional ordeal couldn’t dampen Zanardi’s inspiring zest for life. It’s something that has perpetually inspired his good friend and former teammate Jimmy Vasser. That Zanardi later returned to compete in GT cars in Europe and win gold medals racing a wheelchair in the Paralympics is no surprise. 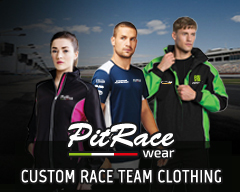 That he would compete in a demanding 24-hour race here in a month? Well, of course. As Vasser and the rest of his competitors already knew so well, there is no slowing Zarardi down. “He was always an amazing champion, an amazing driver, a dear friend, a best friend even before the accident,’’ said Vasser, whose own AIM Vasser Sullivan team is fielding a pair of GT Daytona (GTD) cars in the Rolex 24. “But after the accident, I came to the conclusion… you wonder why? Why? Why? How does that happen to someone like that? That Zanardi pushed himself in a new set of life circumstances, that he never gave up, that he achieved again and again, is of little surprise to those that know him best. His friends and colleagues say that they find themselves simultaneously impressed and yet fully expecting that he would handle himself in such an inspiring way, turning obstacles into opportunities and harsh odds into mere challenges for his substantial heart. That has been Zanardi’s style all along, however. “I don’t think anything surprises me with Alex anymore,’’ said Ganassi, who took his former IndyCar drivers Vasser and Zanardi to dinner with his sports car team while in Daytona. “From his accomplishments in an Indy car with us, to the ranks of Formula 1, and then on to gold medals, and now the Rolex 24. And Zanardi has provided plenty of motivational opportunity since his accident. He won the 2012 New York City Marathon in the hand-cycling class. And we went on to claim gold medals in the 2012 Summer Paralympics in London and the 2016 games in Brazil. His will to overcome challenges, his love of competition and his God-given talent have sustained Zanardi. He is one of those people who makes those around him more comfortable and more positive just from being in his presence and seeing firsthand his completely genuine enthusiasm for life. As he joked in Daytona last week, perhaps the fondness will wane as Zanardi’s lap times drop. Let there be no doubt, that for all the friendliness, laughter and handshakes, there’s a reason Zanardi is a championship driver. He’s fast – no matter the type of wheels or kind of race. For all the love and sentimental thrill of reuniting with Zanardi or meeting this inspiration in person, Vasser reminds that this isn’t a merely a feel-good tour. Zanardi is in Daytona to win. Since his accident, Zanardi competed full-time for two seasons in the ultra-competitive FIA European Touring Car Series, winning three races. He is in Daytona, competing in this race for one reason: to win. He has spent hours in the garage practicing driver changes that will obviously be more involved and turned many laps getting used to the BMW especially outfitted with hand controls for him. “This is just another chapter, it’s not the end of the book for racing,’’ Vasser says emphatically. “He keeps jumping into cars and he does well. It’s not like ‘Oh well, it’s so nice for him to be able to do it.’ No, he’s helping the team to win, legs or no legs. “He’s an asset in the competition side. He pushes the drivers and teammates and his input for the chassis and setup. He’s so engineering minded… I knew the minute (he started his recovery) that he would revolutionize prosthetic builds, the engineering of building them better. Judging by the response Zanardi received inside the garage at Daytona, it’s easy to imagine the reception he will get from fans when he returns for the race. Zanardi may be the one competing, but it feels like the rest of us fortunate enough to marvel in his inspirational story, are winning too. “He just makes life so much better,’’ Vasser says emphatically. “This isn’t post-accident. He’s the same, same sense of humor, same honesty. I could go on and an on and on, I mean you talk about a hero. “I was thinking about it during last weekend, there are some really fantastic human beings on the planet. They are out there. And it’s not because Alex is a racer, but quite honestly, I think he could be the best human. He’s so inspirational and at the very least he’s in that percentile of being one of the top human beings in giving the example of how to not give up. “One step further, you know what? This guy may be one of the best in the world to show how to use your life every day and get the most out of it.